Here you'll learn how to build your own tombstones and transform your yard into a spooky Halloween graveyard. 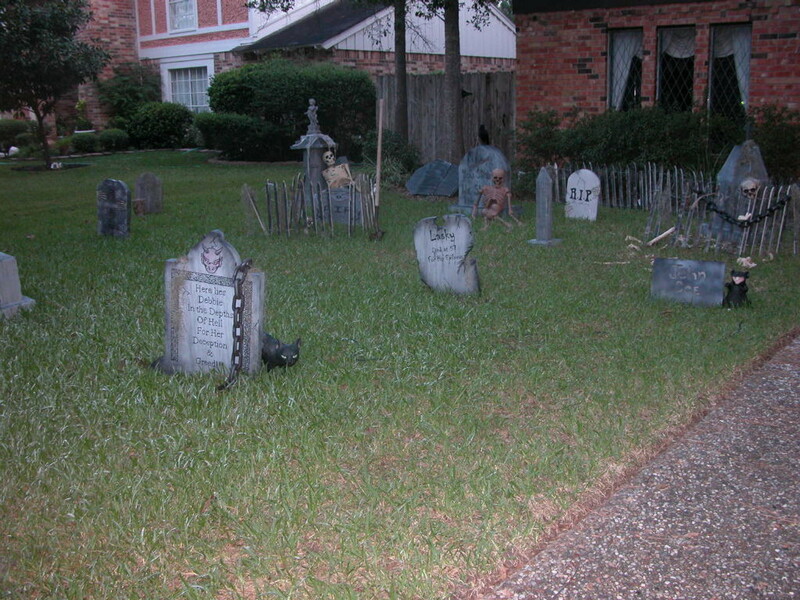 Sure, you can go to Target, Wal-Mart or some other store and buy tombstones, but then your graveyard will look like every other yard in the neighborhood. The store bought gravestones usually have just a basic "R.I.P." or "Happy Halloween" on them. 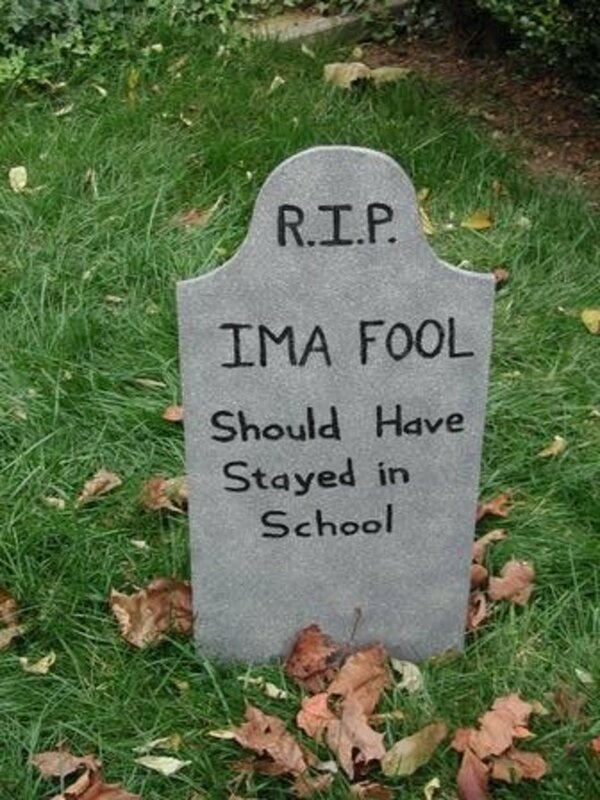 I like more realistic tombstones with funny or scary epitaphs and also enjoy decorating the house for Halloween. So a few years ago I decided to build my own graveyard. Here are my tips for doing it yourself. I built my tombstones using two materials: plywood and styrofoam. Styrofoam is good because you can buy it in larger thicknesses (2" or more) at your local crafts store and it's already textured so it looks more like a gravestone from the start. Sheets of styrofoam insulation from a building supply store can also be used. Styrofoam can be tricky to do the lettering on, is more fragile and thicker pieces get expensive. Plywood is easy to work with, durable and you may already have scrap pieces buried in your garage. A standard 4'x8' sheet will be enough for about 6-10 tombstones depending on their size and shape. There are other materials you can use (stone, resins, etc) but I don't have any experience using those so I'll focus on plywood and styrofoam. Tombstones come in many shapes and sizes. You can look at the sample pics below to get some ideas. Start with a basic and simple design such as the one pictured here. It's simply a rectangle with the top corners rounded off. Next, select the epitaph or saying you want on the stone. You can get ideas for this from websites, sayings you've seen elsewhere, Disney World or your own morbid creativity. There are many sites on the web with listings of epitaphs. Most of them are redundant. These will give you a pretty complete listing of what's out there. 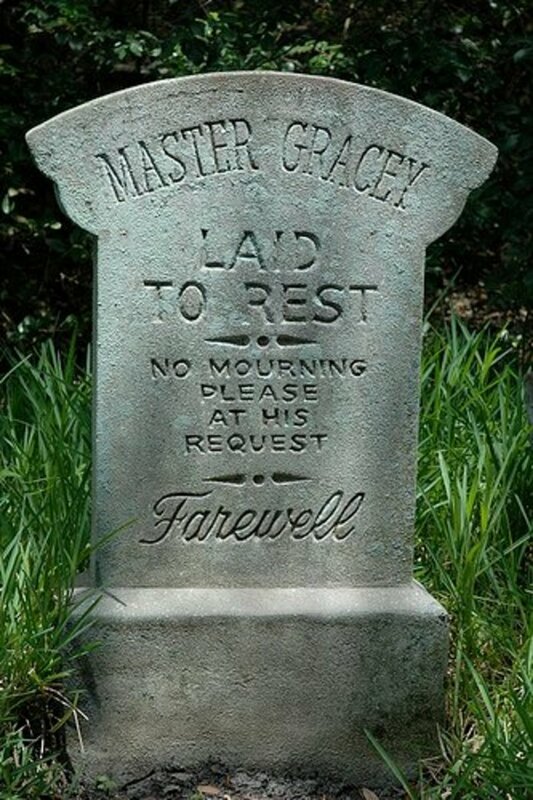 A good collection of different epitaphs and funny tombstone names. A good long list of epitaphs, many that I haven't seen on other sites before. A shorter list of humorous epitaphs. 1. Determine the size of your tombstone. 18"w x 24-30"h is a good size for a basic stone. Make sure there is enough room to write the epitaph. 2. Trace out the design of the tombstone on your plywood or styrofoam. A French curve or cans of various sizes are good tools to help with drawing curves. 3. Cut out the stone. A jig saw works well for plywood. You can use a keyhole (drywall) saw or large utility knife for styrofoam. 4. Paint the stone. For plywood, start with a base coat of grey or off-white. Next, apply a coat of stone texture spray paint to give it a weathered appearance. For styrofoam, you can just use the stone texture paint. 5. After the paint has dried, paint the epitaph and any other design elements (skull, scrollwork, etc) on to the stone with a small brush and black paint. For styrofoam stones, it helps to press the letters into the foam first before painting them. 6. The last step is to attach mounting stakes to the back and place the stone in your yard. 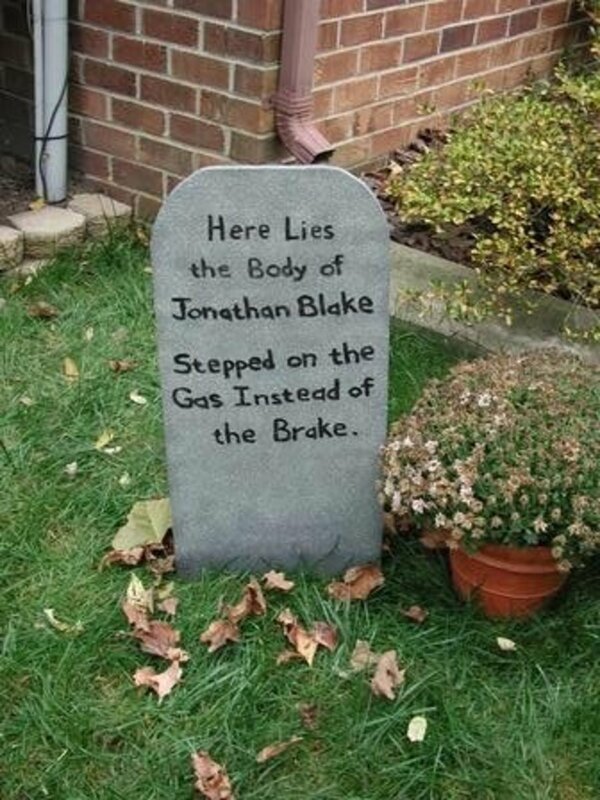 Use whatever you have available to keep your tombstones in place. For styrofoam stones, bamboo plant stakes pushed into the bottom work well. For plywood stones, you can screw shelf brackets or eye hooks into the back then use tent stakes to secure them into the ground. 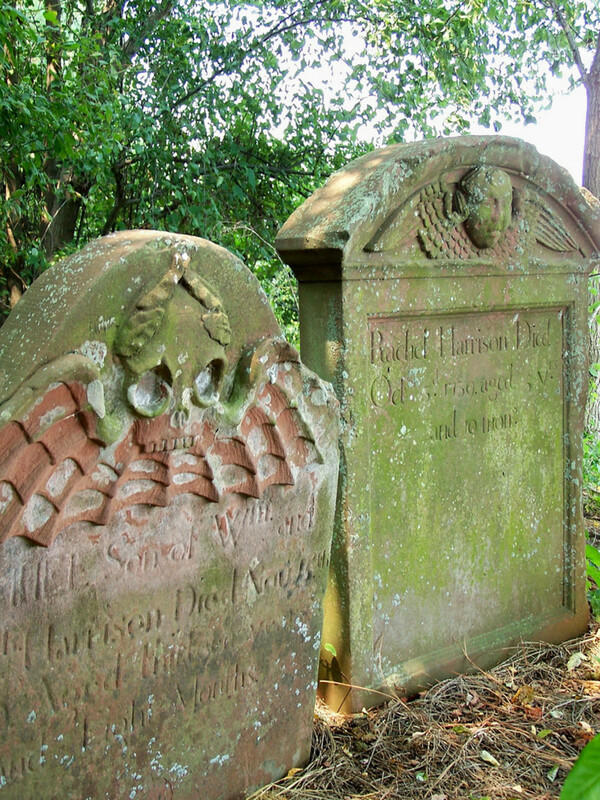 These tools will help you make your own gravestones. I use them and they make the job go much quicker. This economical little saw is perfect for cutting curves on plywood tombstones. It's the same one I use. A good set of French curves will help you draw any curves you want to make on your tombstones. These are similar to the ones I have. Don't mow the grass for a couple weeks to give it a neglected look. Leave dead flowers on some of the graves. Place fake bones, hands and skulls around the graveyard. Hang a Halloween chandelier with flicker bulbs in your graveyard. Dress the family up in ghoulish graveyard costumes to scare and entertain visitors. Position lanterns or electric candles in front of graves. Make a "Danger" or "keep out" sign from a scrap piece of wood. Use a jig saw to cut jagged edges on the ends for a broken look. Use a fog machine or dry ice to cloak your graveyard in an eerie blanket of fog. Hang moss on your grave stones and other props. 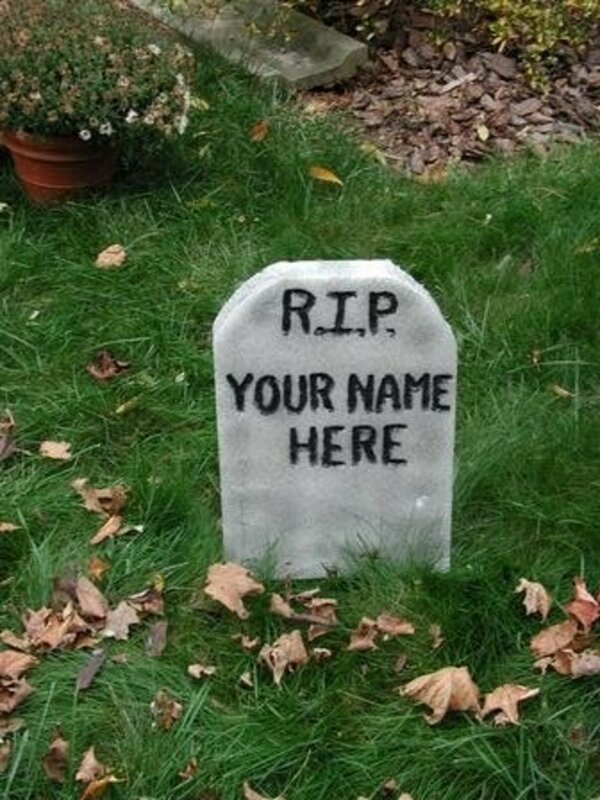 Make up a sinister sounding or funny name for your cemetery and make a sign for it to welcome victims...er, guests. Pile fresh dirt (a couple bags of top soil) in front of gravestones for a fresh grave look. Put a piece of plastic or tarp underneath the dirt for easy clean up later. Play scary sound effects or music in your graveyard. Look online to find sound effect CDs or MP3s. Skulls are a natural fit for a graveyard, but be strategic about where you place them. Discovering one near a grave or in an unexpected spot will give someone a treat. Here is a unique skull I found that's scary looking enough to frighten trick or treaters and is also interesting. There's something about a decorated skull that is morbidly cool. If you already have some plain skulls, you could paint your own unique designs on them. The Haunted Mansion at Disney World has always been one of my favorite attractions there. Its graveyard with the funny tombstones was the inspiration for making my own. Prepare for next year by hitting the stores right after Halloween. Most retailers discount their Halloween merchandise by 30-75% starting November 1st. I've scored good deals the day after Halloween on all kinds of graveyard props including lanterns, plastic cemetery fencing and zombie flamingos. Yes, I've even bought some gravestones that had unique designs and the clearance price was right. Here's a good video showing how to make gravestones from styrofoam insulation. In case you don't have time to build your own tombstones (give it a try, simple ones don't take long to make), buying one online or at the store is another option. Visiting or looking at pictures of real graveyards is a great way to find ideas for your own tombstone designs. Old graveyards like the ones pictured below can provide you many creepy ideas. For more good pictures of old gravestones, check out the Historic Graves project or search on Flickr. A fog machine adds the finishing touch to your haunted graveyard's atmosphere. Hide one underneath a bush or behind a tombstone. For the best effect, place multiple fog machines around your graveyard. The fog juice liquid that goes in them is a good item to look for when shopping the after Halloween sales. It will last until next year and beyond. This is similar to the one I have. Want to Learn More About Graveyards and Find Inspiration for Yours? Cemeteries everywhere are rich in history, art and interesting stories. Take some time to explore and appreciate them. Here is a good book on the symbols, images and monument designs used in cemeteries to get you started. Use it to find inspiration for your own homemade graveyard. Here are a few other Halloween graveyards for you to admire and be inspired by. Photos in the Choose A Material, Choose A Design and Epitaph and Build the Tombstone sections are copyright and used by permission of Mac33. Brother Claude and Here Lyeth His Loving Wives used by permission of Miss Shari. Good Old Fred used by permission of BoredTrini. Sweet Leota used by permission of canno1979. Master Gracey used under Creative Commons from devilelephant. Brother Dave used under Creative Commons from The Consortium. Tombstone in Satnitz used by permission of iproduit. Gravestones used by permission of Ben Adlin. Tombstone used under Creative Commons from A.M. Kuchling. Irish Castle Graveyard used under Creative Commons from Qole Pejorian. Boot Hill used under Creative Commons from danesparza. Skull w/wings used under Creative Commons from mchphotography8. Used under Creative Commons from their respective owners. Was this guide helpful to you? How did your Halloween graveyard turn out? Please leave a comment below. Take a Walk Through a Graveyard. It'll Be Good for Your Health and Your Soul. Back to look at this interesting lens - maybe we will try to build this for Halloween this year. Graveyards are great for the front yard. This guide is useful. Very nice, styrofoam seems like the way to go (too lazy to drag the circular saw out of storage)! 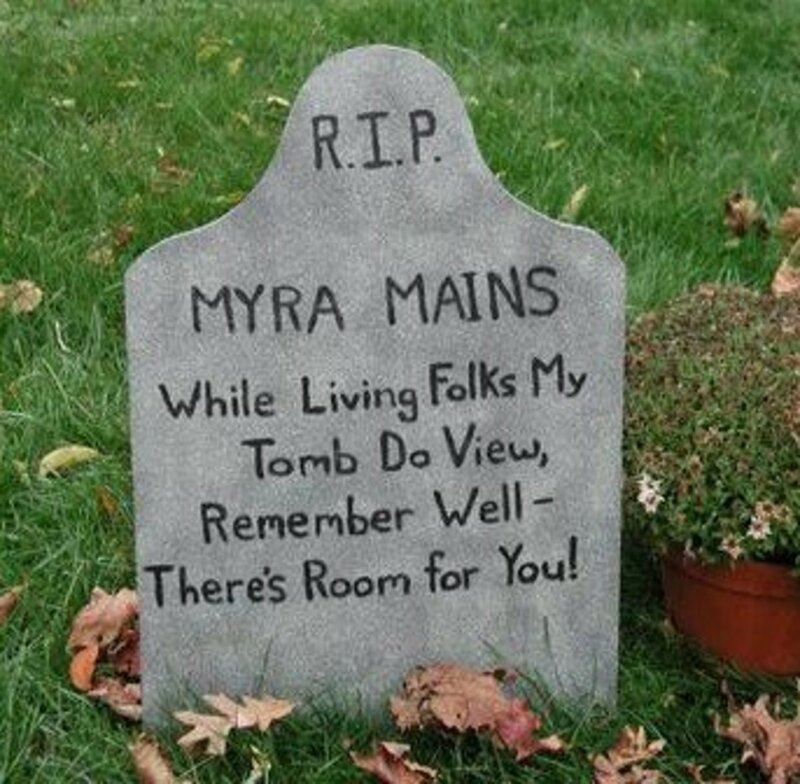 I also think it'd be cool to go with the "fresh grave" look and leave a mound of dirt in front of the tombstone with a bloody hand reaching out from it. We do this in our yard, and we take our old shirts and use gloves that we get throughout the year (yes we get them just for this purpose!) and make zombie arms. Then get a shirt and old mannequin head and you can have a zombie halfway out the ground! LOVE this lens! Spooktacular gravestones, thanks for the Halloween tips! What a great idea! Great lens! Very informative, I have not tried to build a graveyard yet though. I am currently looking for some Halloween costumes; you gave me some great ideas. Great idea for Halloween. Thanks for sharing. Haven't built one yet, might give it a go. Great idea. This is such an original lens, I love it. Those hands crawling out of the ground give me the creeps! Interesting, great idea on building a graveyard ... too bad I'm in a Condo and don't have a backyard! Awesome and scary ideas. I love it! Scary stuff :*) Great leans and I'll refer back if I decided to build a graveyard. Great fun lens. Thanks for sharing your tips. What a fun lens. Now I can make my own Halloween Graveyard...if I want to. Very creepy indeed! Nice lens though! Happy Halloween! Should be creepy but sounds fun. Thanks for the tutorials! Can't wait to try them out! Very fun and creepy ideas. Ooh, nicely done, and taking notes for the new Halloween Graveyard decor. Great tips! Wonderful Halloween lens. Everything anyone could ever want to know about having his/her very own graveyard!!! Awesome! Your own boneyard for Halloween - what a grand idea! Thank you for all the tips! My relatives are really into making their lawn a spookfest. 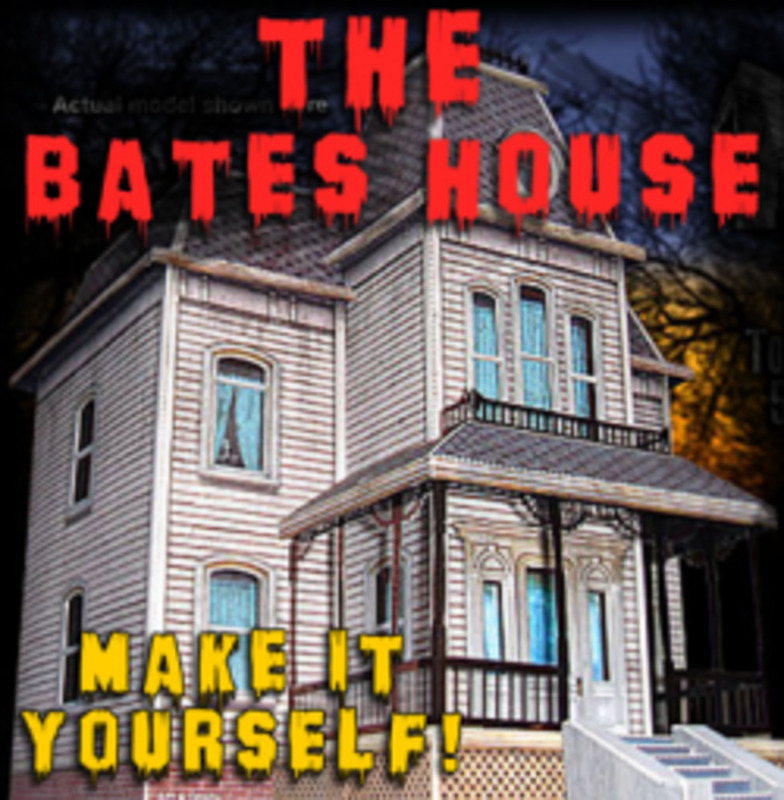 It's the best in the neighborhood...with many of these additional ideas, this will surely be a Halloween to remember. Thanks!! 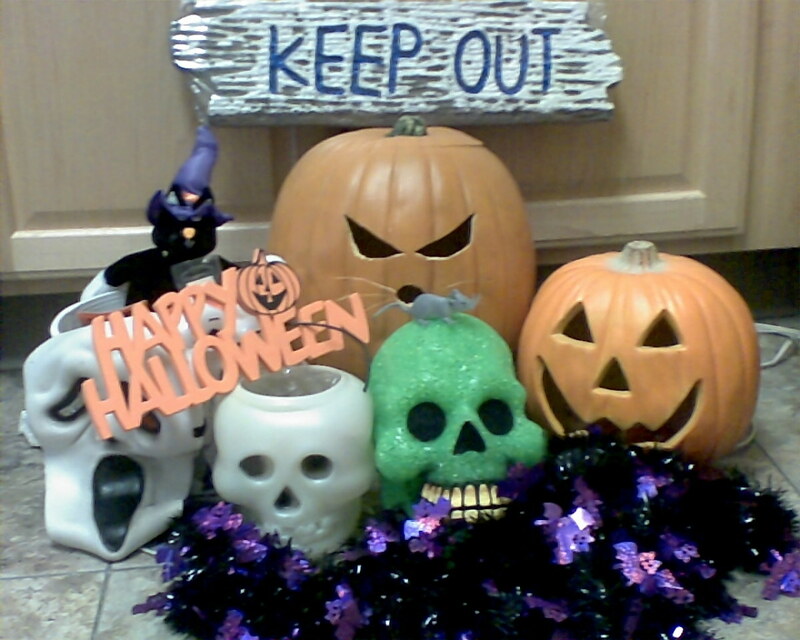 Great ideas for creating spooky halloween party ambience! Wow lots of things to scare the neighbors! fantastic job. Very instructive, very fun. Blessed! These are really great ideas. Will probably look into doing some of this in our back yard. These are great suggestions. I would like to try this one day. Great advice, great lens! I've never done a Halloween graveyard, but now at least I've got a start. What a great idea and tips! Come from and live in another country where we don't celebrate Halloween, but I'm fascinated with this cool Halloween concept! This is a cool Halloween project to do with the kids, thank you for suggesting it. Great idea... I've tried some store-bought gravestones but they don't last and lack that personal touch. I love the funny epitaphs. The Haunted Mansion at Walt Disney World has some funny ones. I can't wait for my kids to do this halloween project! Love this idea! Great work. You saved me a bunch of work for this Halloween decoration. Great!!! That was very good, I'll have a go now and halloween!! How fun! I suppose I shall have to try your technique! Thanks! Now I want to make some homemade tombstones for Halloween this year! Great inspiration for a Halloween party! 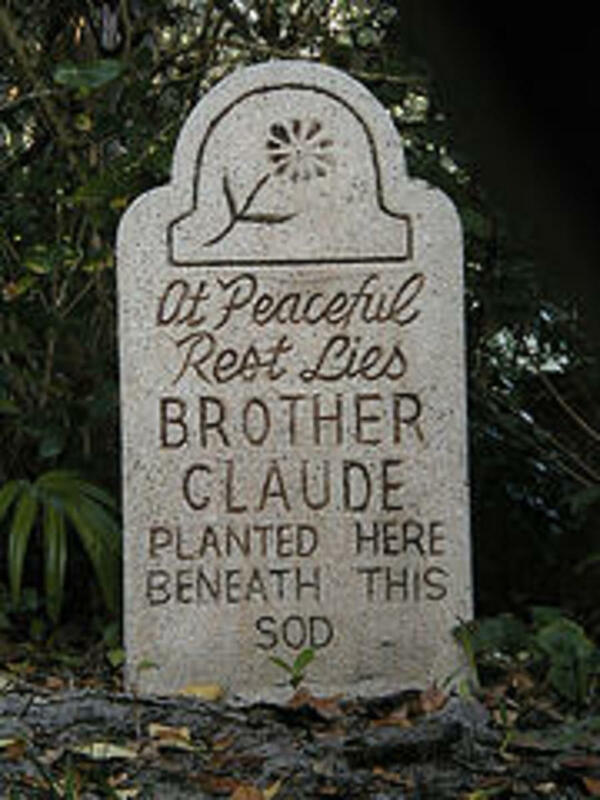 Love it, especially the tombstones pictures at Disneyland and the links to epitaphs. Good job! This is pretty spooky! Picked this lens for a Squid-quest. Blessings. Gosh, I truly love touring graveyards! So, count me in. Never made a graveyard, but now I'm confident I can. I have the space for it and maybe it will encourage more kids to come trick or treat this year. Nicely done. Hope you win a prize for most authentic graveyard. Might put into practice a few of these ideas. Could use a few more garden props. Fun ideas! My wife and I are making some tombstones. I have extra 1/2" cement board that I am using. Nice thing is that it's water resistant (much more so than plywood) it's gray in color and durable. Thank You for the lens, You are helping other people in their Halloween preparation's, This is why this lens is great. I have yet to make a graveyard, but will plan better for next year. Too many commitments this year, but you have some great info here. Yes, we have some people who go all out around here. If I had a substantial yard, I probably would do the same. I have been making graveyards for years and people love it, It takes some time because I am very particular, but I get a lot of compliments on my graveyard, I even have neighbors coming by and taking pictures. Its the best part of my decorations!! I like your ideas of making unique decorations. Kind of cool if you really get into the Halloween spirit. Awesome an well put together. Blessings to you! Not sure how a graveyard is going to effect my house price but worth it, lol. Awesome stuff, only 4 weeks to go! Great lens and I wish you a great halloween time. Awesome lens, I definitely learned a few things, thanks for sharing! I really like the graveyard accent section. This sounds more to my taste. Store bought stuff is so expensive you have to keep it but then you have to store it. Making my own? Well I can still keep it but I can also get rid of it if I want! cool. so much less expensive than buying your own. this is awesome! you really love halloween - great lens! I like the idea of the inscription on the tombstone being personal and unique. Ooh! I'm spooked! Quite idea. Have been thinking of trying something eerie this Halloween and you have given me some great ideas. Thanks! If I wanted to make an eerie graveyard, you have given some great details.